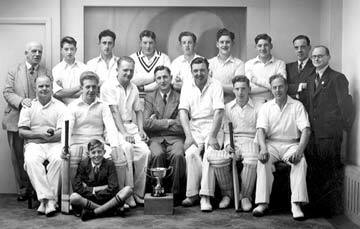 Cricketing triumphs marked the Diamond Jubilee celebrations of an Upper Calder Valley club which, rather like the record-beating soccer team featured in our last issue, sadly folded at the height of its glory. In the early 1950s Heptonstall Slack was Second Division Hebden Bridge League champions, around the same time as members celebrated their 60th anniversary. As well as considerable sporting achievements on the field, the club marked this important milestone with a grand dinner at Hebden Bridge Trades Club at which Brian Close  then the England teams youngest-ever player at just 18 years of age  was guest of honour. Other cricketing legends who also attended included Johnny Wardle and the West Indian opening bat Conrad Hunt. All the players are identified in Milltown Memories issue 3, where you can also discover the eventual fate of the club.